Windows 10 requires 32% more graphics consumption than Windows 7, which means in a virtual desktop environment, the end user experiences slow performance, and applications that won’t launch. When the OS is deployed using graphics processing units (GPUs) these additional processing requirements can be offloaded, enhancing overall performance. 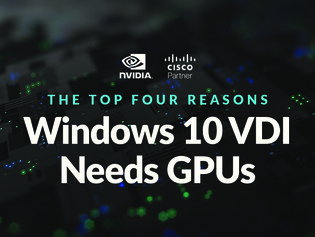 Download this white paper to learn 4 ways GPUs can help improve your Windows 10 deployments in a virtualized environment.